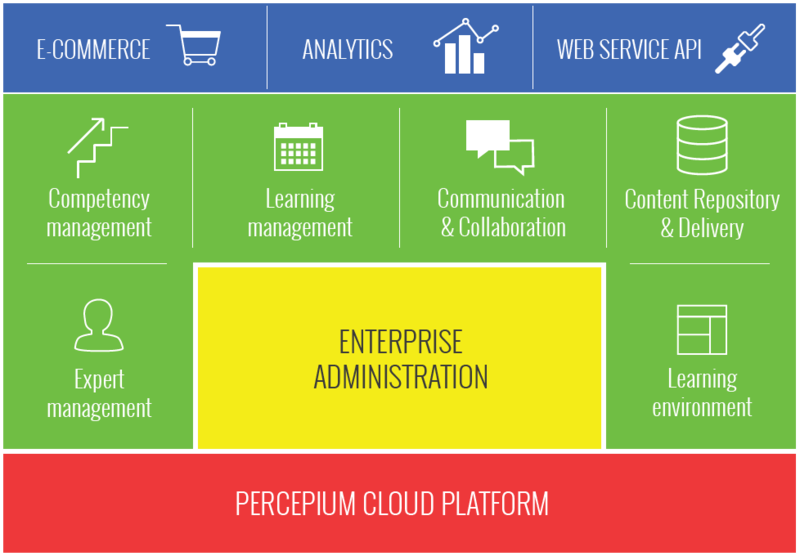 Percepium Learning System is a comprehensive CLOUD based solution with apps for Learning-, Competence-, Performance management and Analytics. The Percepium platform is designed for enterprise class scalability, adaptability, security and robustness including training process automation, adaptive and personalized user experiences. It is a Rich Internet Application, very lean and easy to use, offering the latest generation of user experience on the web. The solution is multi-lingual and support RTL languages like Arabic and Hebrew. 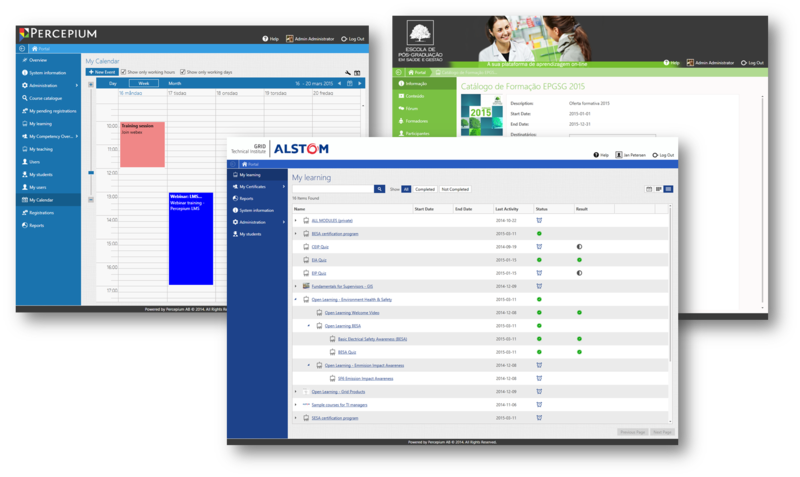 All modules in the system are seamlessly integrated and is managed by a central and unified administration. 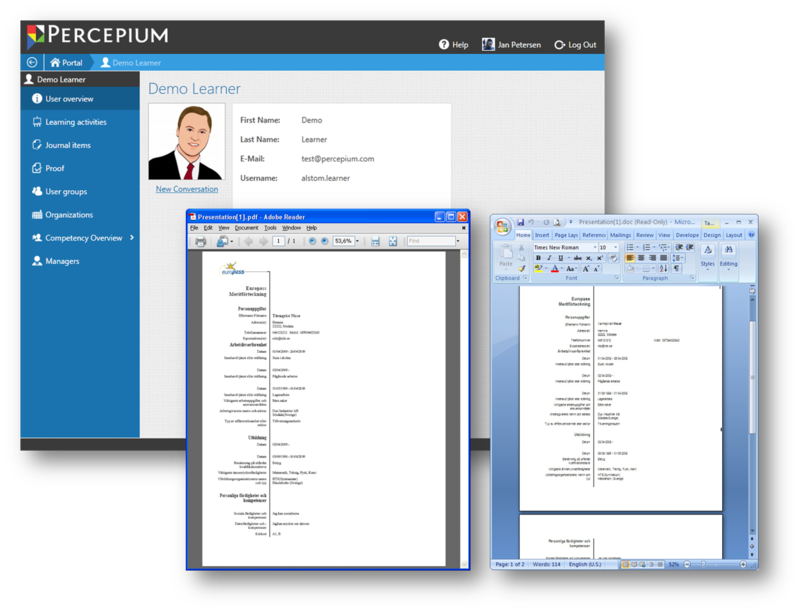 Learning management and training delivery is the foundation of the Percepium product. Our system enables organizations of any scale to build, implement, manage, deliver and track many different types of learning initiatives supporting both formal and informal learning processes. Different types of learning activities can be created, configured, re-used and organized into blended learning and programs. The system include extensive support for practical training scenarios like apprenticeships and skills validation processes. Learning activities can be linked with classifications to catalogues, competencies, credits (CE) and thus truly supporting competency based learning. Advanced learning remediation scenarios can be personalized, automated and sequenced based on outcomes and results from assessments. Learning and development plans or paths can be created for both individuals and groups. Learning process automation is supported including management of both internal and external target audiences. Personalized and targeted learning experiences can be achieved with a minimum of administrative overhead. 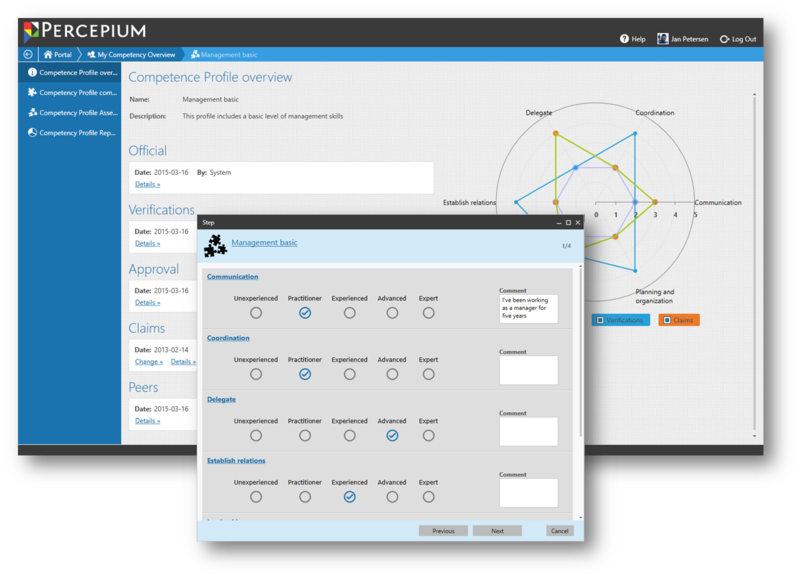 Percepium LMS integrates and support the entire competency life cycle process and provides a unique view of workforce competency, performance and development needs through a series of configurable indicators. Our system is unique in the way competency and learning are fully integrated in one process allowing competency based learning scenarios. This module includes construction and maintenance of different competency models and associated rating scales with multiple assessment capabilities and workflows like self, manager, peer ratings and diagnostic testing. All data are gathered and provided with detailed business intelligence support from building the competency models, conducting the assessment process, providing the development plans and tracking the training process. Organizations can see how their personnel are performing across the overall organization, by department, by job areas, by geographic location or down to an individual basis. Demographical data can also be represented if existing. In addition, the system tracks course completion and reassessment of the individuals after training is completed to ensure the competence is developed. It can also be used as a mean to analyze and estimate the training needs, resources, time and money required to bring employees or learners to their competency target level. The system improve upon the way employee development is normally managed and provides new, relevant metrics that are crucial measuring performance. Communication & collaboration plays an important role in training and how people learn. Informal learning activities constitute a substantial part and could represent as much as 60-70% of the overall learning activities within organizations of today. Therefore, communication and collaboration tools have a vital role in our product. Communication tools are integrated and existing in the different learning, expert and competence management activities. Both synchronous and asynchronous communication tools are available. Beside the standard communication and collaboration tools in the platform we have chosen to seamlessly integrate, as an extended option, with the market leading Microsoft Lync communication platform. With Lync enabled our clients and users will extend the social learning and networking capabilities. In addition the platform support 3rd party tools like WebEx, GoToMeeting etc. The expert knowledge management module addresses the issues relayed to knowledge loss and readiness within organizations. Readiness is becoming more important as product life cycles becomes shorter. Knowledge loss is a growing organizational problem as the workforce ages and employee turn-over increases. Expertise that resides in the minds of key individuals can quickly leave the organization. These contributing factors have brought many organizations to a point where they must put in place both immediate knowledge capturing programs as well as adopt a strategic approach to avoid such situations in the future. Our expert knowledge management capabilities support a wide range of approaches by combining and configuring different features and concept in the product ranging from expert areas to communities of practice. This module is used to capture and transform tacit knowledge into content that is valuable and reusable across the organization. 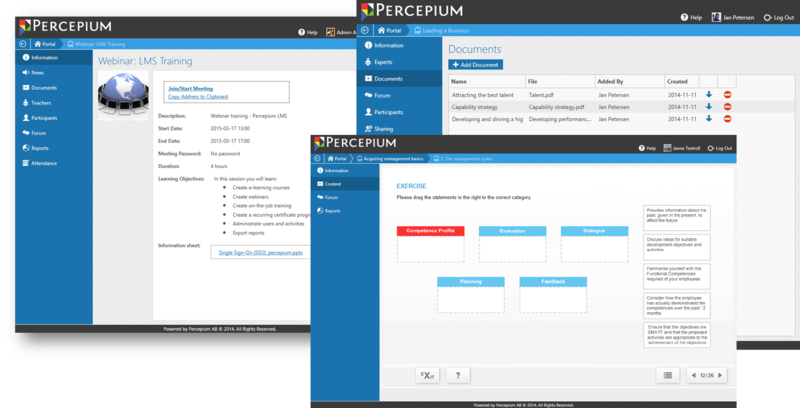 Percepium business intelligence capabilities includes an advanced reporting framework and data warehouse solution. This allows organizations to get both just-in-time and historical reports showing trends and achievements over time. The system is pre-configured with several standard reports and customized reports are easily developed within the framework. Users also have the ability to create their own reports by taking out all lists with configurable tables in the administration or connecting and pivot data directly to the data warehouse with different 3rd party BI tools like Excel. 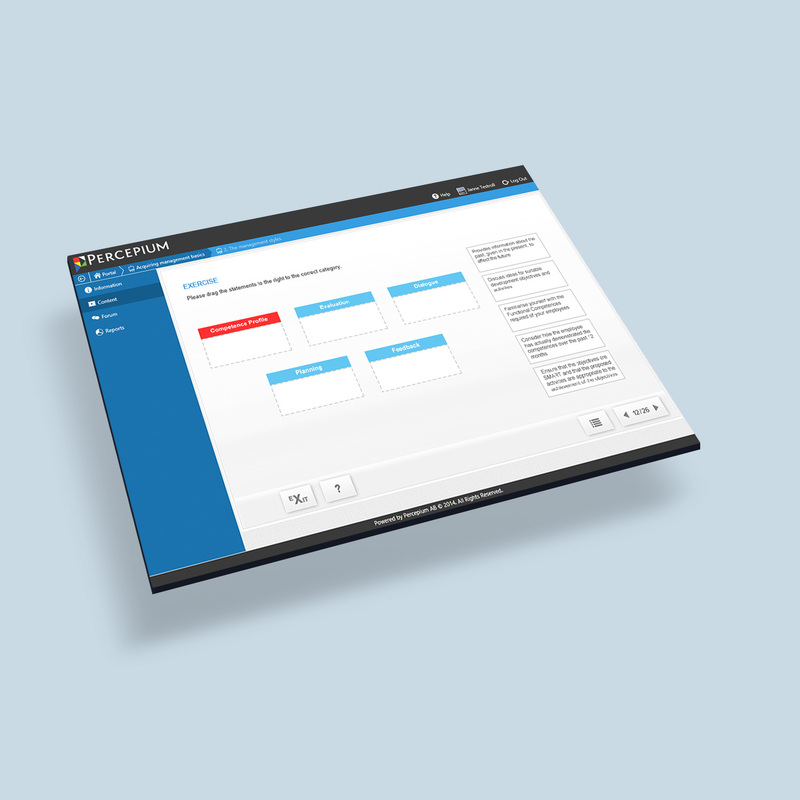 Each training scenario above can be configured by yourself to suite your needs. Completion of activities may award learners with certificates, competence levels, credits (CE) and grades. Activities can be sequenced with automatic enrollment chains and include awards as prerequisite criteria. This enables automated personalized learning paths depending on current competencies, test scores or demonstrated skills. An extensive notification engine sends out gentle reminders to your learners to make sure that they are on track. Our system is unique in the way competency and learning are fully integrated in one process solution. That includes construction and maintenance of many different competency models and rating scales, with multiple assessment capabilities and workflows. Central storage and management of all learning content and assets. Index, classify and search according to content types and permissions with different metadata profiles and tagging. Version management enables instantaneous propagation across active learning activities, while still able to track user performance. Language variants enables the learner to receive the content in their preferred language. Import both structured content, following international standards, as well as any media file format depending on security settings. Support for SCORM 1.2, 2004 and IMS packages. With our advanced reporting framework and data warehouse solution, organizations can get both just-in-time and historical reports, showing trends and achievements over time. 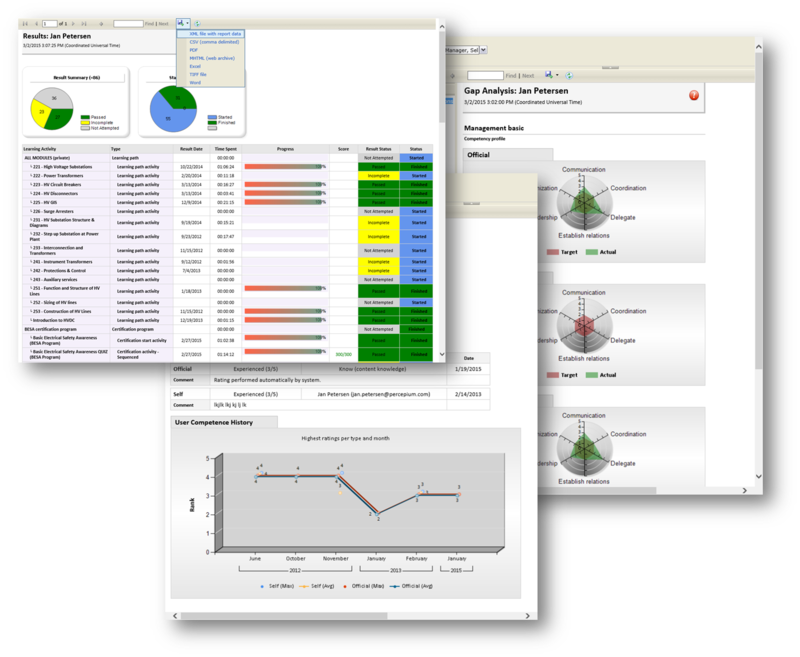 The system is pre-configured with several standard reports, and customized reports are easily developed within the framework. Access overview as well as detailed information, with drill down/up functionality within the same report. All reports can be printed out or exported into several formats, like CSV, XML, PDF, Word, Excel and HTML. 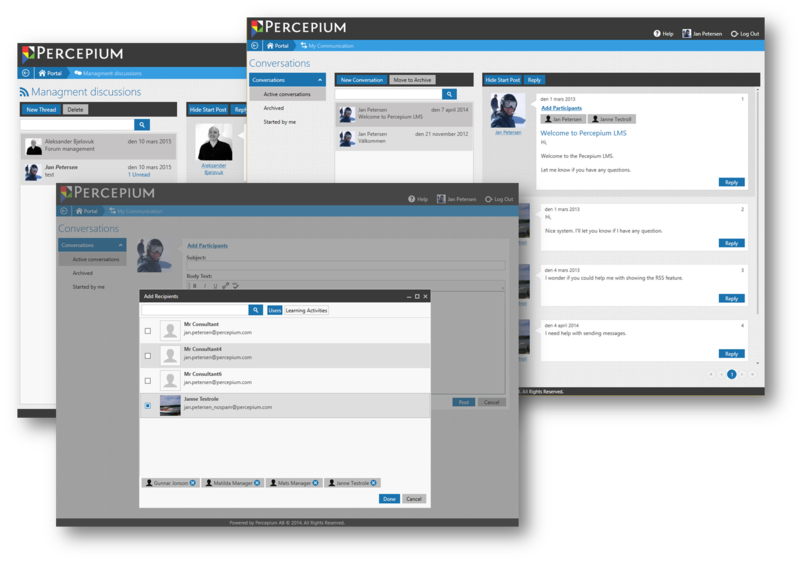 The unified enterprise administration module is the backbone of the Percepium LMS product. The solution is built to manage very large user populations both from an administration interface point of view and system architecture, performance and scalability. An organization can manage their user communities in any domain hierarchy with true inheritance and with multiple visualization options to reduce complexity for different users. With multi tenancy support, high flexibility and extreme configurability, organizations can set up domains, roles and permission structures as granular they require, supporting and managing multiple learning activities and competency constructions. Our ePortfolio management module provides powerful tools for collecting, storing, planning, demonstrating and sharing individual growth, achievements and performance. 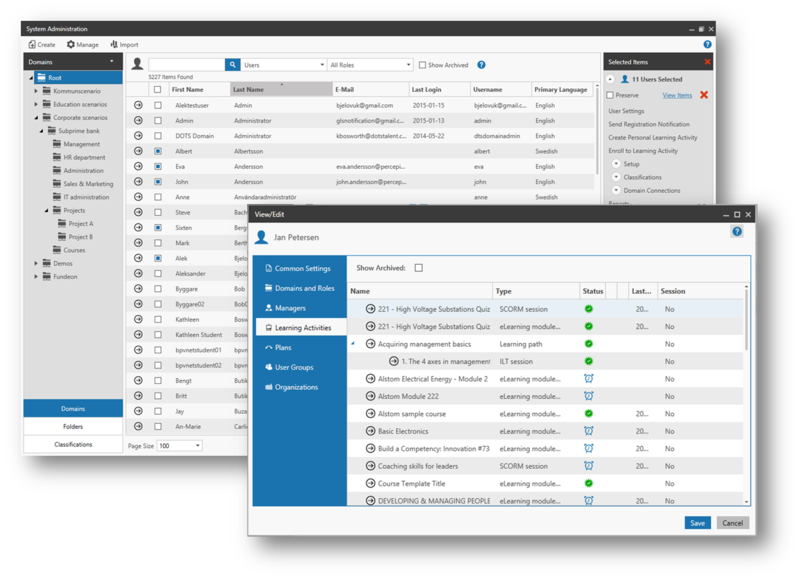 It can be configured for both organizational and individual requirements, with possibility for multiple configurations within the same organization, allowing for a targeted approach depending on end users background and profiles. 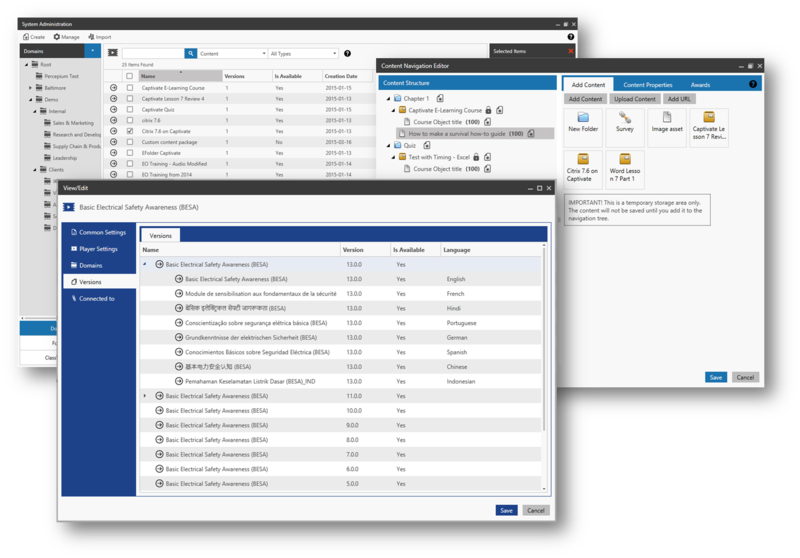 Users can create dynamic views and standard CV outputs, as well as communicate with coaches and instructors facilitating eMentoring processes.